Posted by Mariel Hiemstra in Travel Log. I’ve been home almost a week now from my summer in France. Since coming home I’ve been asked several times if I would ever consider living in Europe. My answer: yes and no. There are definitely things I realized this summer that Europeans do much better than Americans, but there are also some things, in my opinion, that they don’t do as well. The first thing I liked about Europe that’s different from the United States is the lifestyle. Things seem to happen at a much slower pace. For example, meals are more about dining than eating. It’s a social experience that can take several hours. 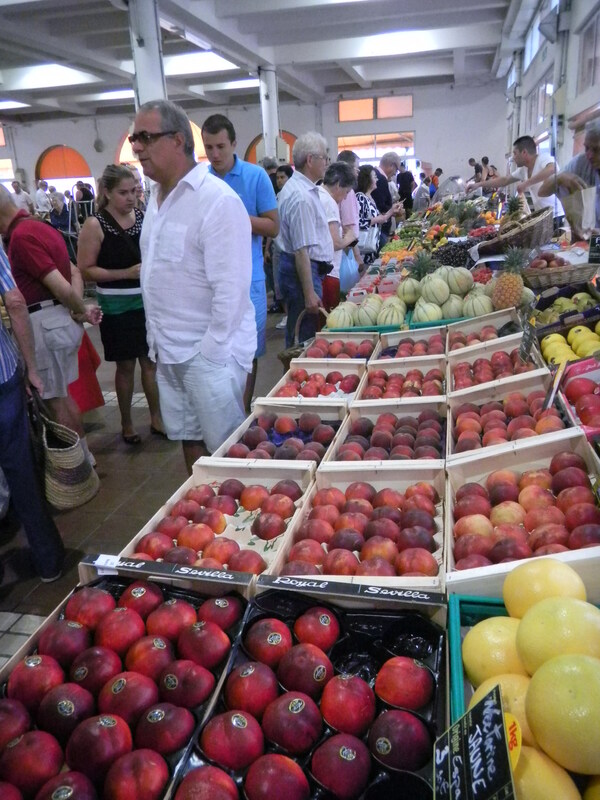 There are so many more markets in Europe, with most of the products coming from the local area. People tend to go grocery shopping everyday buying fresh products from the local bakery, butcher, and cheese shop. It also seemed like Europeans value being outdoors more than Americans. Everywhere I went I saw so many people riding their bicycles and walking, enjoying the weather whenever they had the chance. Another thing I really enjoyed about Europe was the travel experience I had. The train system that is set-up there makes it so easy to get from country to country. And with the close proximity of countries and the location of Metz I was able to go to dinner in a different country if I wanted to. One interesting thing I observed while I was in Europe for the summer was how Europeans feel towards Americans. Before leaving Atlanta for the summer the students participating in the GTL program were given a sheet listing typical American stereotypes and we were advised to avoid these so that we wouldn’t stand out. The main one was that Americans are viewed to be loud and obnoxious. As much as I hate stereotypes, I found this one to be true while I was abroad. I’ll never forget when I traveled to Paris for the first time and was on the train headed out to Versailles. Since Versailles is such a touristy spot the train was filled with American tourists. It was so loud I almost couldn’t stand it. People were shouting to their friends who were at the other end of the car and laughing loudly as their friend next to them told a story that everyone else aboard the train could have easily heard. It was a much different experience than taking the train that morning from Metz to Paris which had been filled with mainly French business men and women and had been almost entirely quiet. I definitely noticed that I was back in the United States when I landed in the Charlotte airport last week. But as incredible as Europe was, there were definitely things that I missed about the United States. We tend to take advantage of simple things like free public bathrooms and free tap water, but when you go without them for an entire summer you realize how lucky you are to have those basic things in the United States. I had an amazing experience this summer and I can’t wait to travel back to Europe someday exploring different regions and cities that I didn’t get the chance to visit. Not only did I gain an appreciation for different cultures while abroad, but also for the life I am able to have back in the United States. 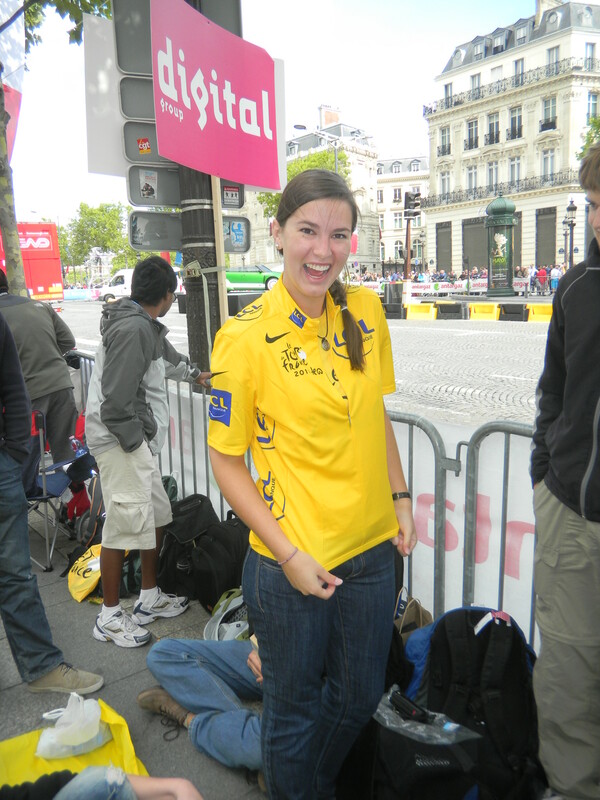 I’m a pretty big cycling enthusiast so when I learned that the final stage of the Tour de France was on the Sunday during the final weekend that I wanted to travel I knew that I had to go. I was headed back to Paris for the third time of the summer. 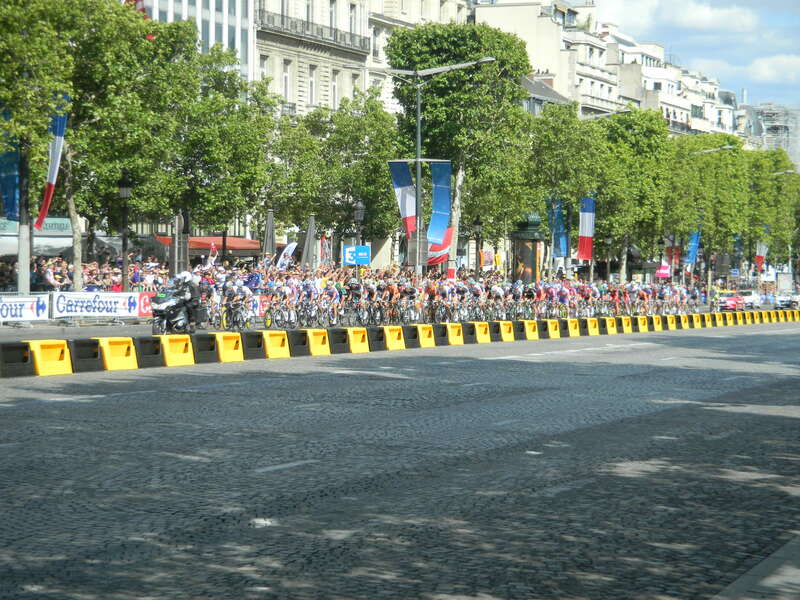 The final stage of the Tour takes place on the Champs-Élysées where riders make eight passes up and down the road before finishing. I knew the riders were expected sometime in the afternoon and after my Bastille Day parade experience I wanted to get down to the Champs as early as possible to claim a viewing spot. So after an early wake-up at 5am my friends and I were down on the Champs at 6am, only to find that the streets were dead. It was so strange to be walking through such a well-known part of Paris and pass only a handful of people. 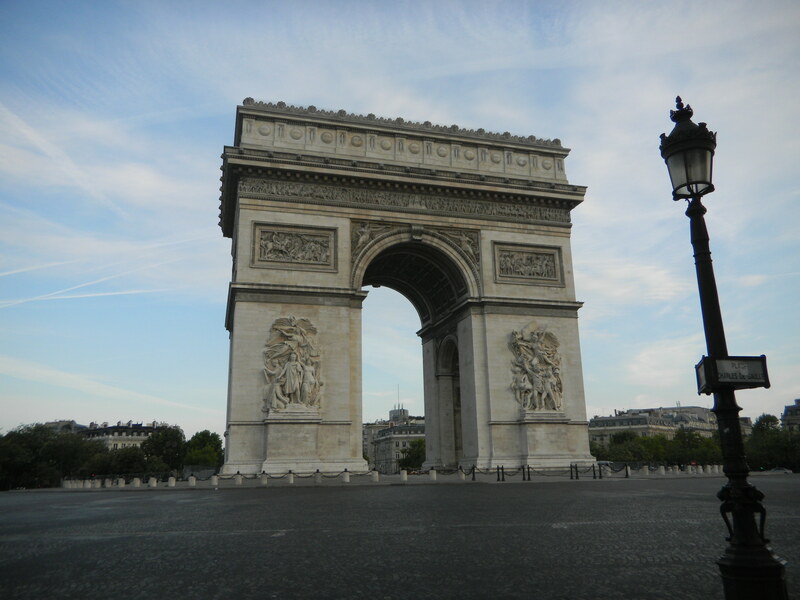 What was even stranger was to be able to see the Arc de Triomphe without any cars in front of it. Such a rare site! I originally thought that the riders made a loop around the Arc. 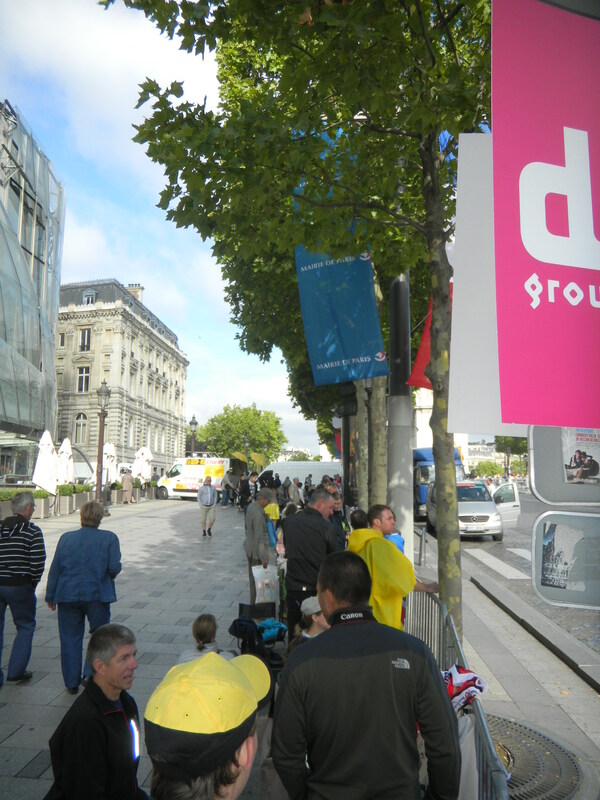 After talking to some of the vendors I learned that they actually turned sooner than that around the last set of barriers that went down the middle of the Champs. I also learned during that time that the riders weren’t expected until 4:30 that afternoon. We had a long day ahead! But with very few people out, except for a few other dedicated Tour fans, we had lots of options for where we wanted to watch the race. So where to go? Well we figured that the fans who were already out probably knew what they were doing so we found a spot near them. This spot happened to be near the point where the riders would turn around. We thought this would be great for pictures because then they would have to slow down. After a couple hours only a few more people had gathered near us and I began to get worried that I had overestimated the enthusiasm for the event and had forced my friends up much earlier than was needed. At this point they decided to go grab some breakfast so I stayed behind to hold our spots. While they were gone I struck up a conversation with a man seated near us who had a flag from California hanging up in front of his spot on the fencing that stood between us and the road. It turned out that he was in the Air Force and that this was his eighth year in a row of coming to the Tour. He picked the same spot every year for the same reasons that we had chosen that place. I expressed my worries to him about the number of people that were there to watch the event and he reassured me that it would soon get very crowded. Just a few hours before the riders were due in there would at least be another 10 rows of people who would all be pushing forward in order to get a better view of the cyclists passing by. 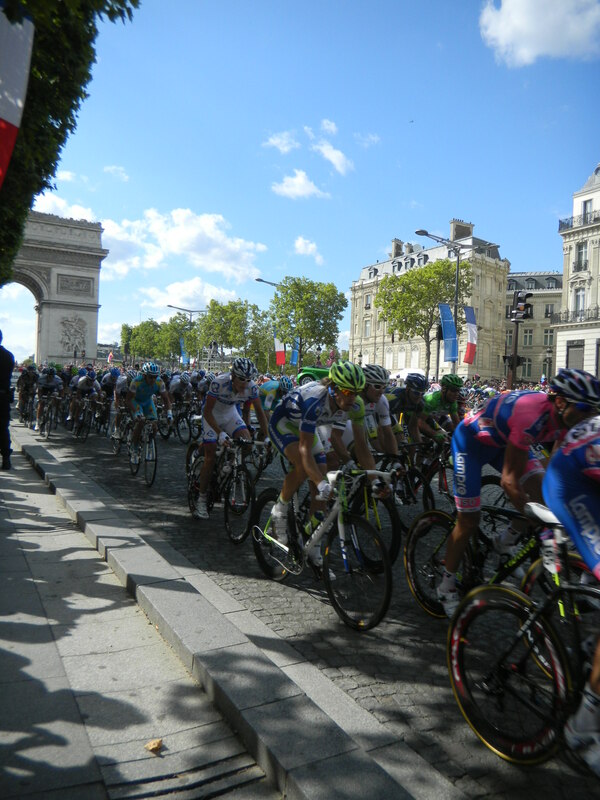 Throughout the rest of the morning I watched cyclists riding the route up and down the Champs. Sometimes it would just be one person and other times it would be entire clubs. They were all taking advantage of the chance to ride on the same route as the top riders in the world. I also took some time to go on a search for cycling jerseys for my Dad and me. There are four types of jerseys in the Tour de France: the polka dot jersey for the best climber, the green jersey for the best sprinter, the white jersey for the best young rider (under 25 years), and the coveted yellow jersey awarded to the overall winner. I was determined to find a polka dot jersey, but after lots of searching and no luck I ended up with a yellow jersey for myself and my Dad. On my way back to our spot I noticed that a group of men had taken place right behind us. They were all well over 6 feet tall and look liked they could easily pick any one of us up and move us to wherever they desired. After talking to them I learned that they were all from the Netherlands and I also realized that they were some of the nicest people I had met all summer. So I was excited when they offered to team up with us in order to protect the spot that we occupied when the crowds got to be unruly. I was even more excited for the riders to arrive, which was still another four hours away. During the afternoon I did some more exploring before the crowds got too bad and found a shop where they were selling beautiful looking macaroons. I decided I had better try one before I left France for the summer so I grabbed one chocolate and hazelnut and a pistachio macaroon. Why I waited that long to try this dessert I’ll never know. They were delicious! 3 hours prior to the race I went back to my spot and didn’t move from that location until after the race was over. The Air Force guy from California had been right, there were easily at least another ten rows of people behind me. By this time they had completely blocked off the Champs in preparation for the riders to come through and while I stood there waiting like everyone else I noticed a man dressed in clothes that appeared to be from the early 1900s and riding a bicycle that appeared to be from the same time period. After he passed so did several offical Tour vehicles followed by a float which featured a rider in a yellow jersey. It was a parade! Every team’s sponsor had a float. Each had an elaborate design and drove by blasting upbeat pop music while young people sat atop them shouting things in French. Another group of official Tour vehicles signaled the parade’s end. And then the waiting ensued. Everytime a vehicle would pass by I would get excited only to be disappointed once again. After some time I began to hear cheering coming from far down the Champs which continued to get louder and louder. The riders were here! It was such an incredible site to see this group of over one hundred tightly packed riders coming up the Champs. They were so close to us when they passed by. If the fencing in front of me had been forward just another foot I could have easily touched them on the back. The fourth lap. I was so close! 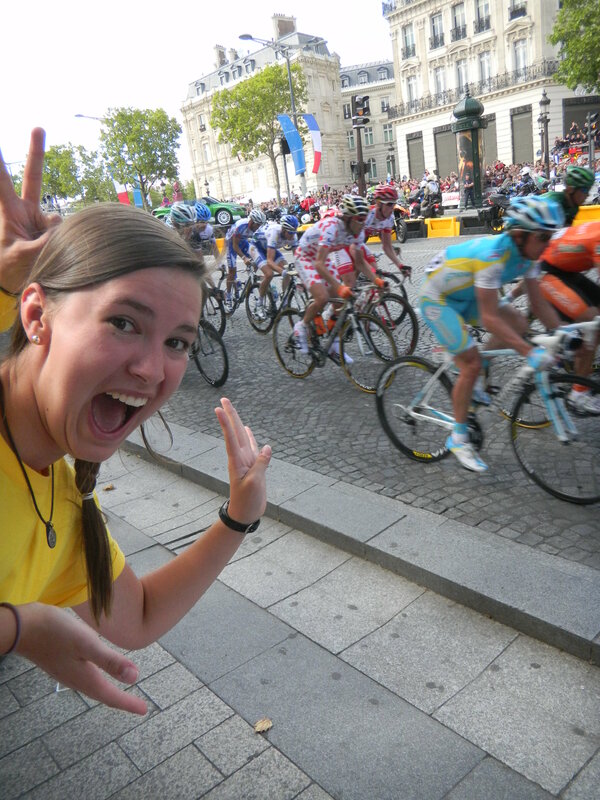 The cheering around me was drowned out by the sound of clicking as all the riders began switching gears. Following the pack were all the team cars with several replacement bikes on the roofs. As the laps continued to progress, the riders spread out from the massive group and leaders began to emerge. Being able to see the top riders in the world and be so close to them is such a memorable experience and one I will never forget. It was a great ending to my European summer adventure. “C’est la vie” is a commonly used French saying that translates to “That’s life” in English. For my last four day weekend in Europe I decided to travel to Spain to visit Barcelona. During those four days I learned to truly appreciate this short, simple phrase. Getting to Barcelona by train is tricky, but after several trips to the Metz train station and trying many different combinations of train times online, my friends and I finally figured out a way to get there. We would first have to go through Paris before hopping on a train south to a small town near the French/Spanish border. In order to catch this train we would have to spend the day in Paris which worked out well for us because July 14 was La Fête Nationale, also known as Bastille Day. This French National Holiday commemorates the storming of the Bastille during the French Revolution. 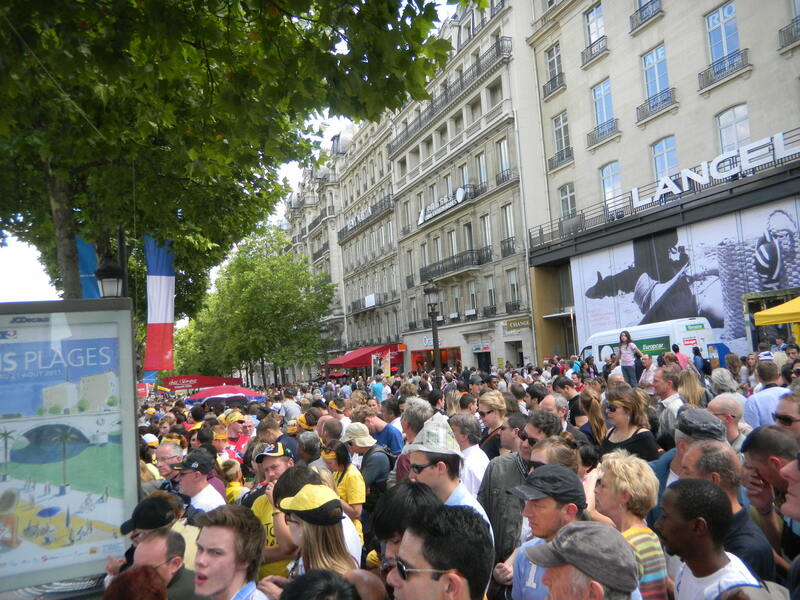 The festivities to celebrate this holiday in Paris are very similar to the events for the Fourth of July in the United States. Fireworks at the Eiffel Tower, concerts, dance parties hosted by the city’s firefighters, and the largest military parade in Europe were just a few of the events. Since our train departed early in the evening we were going to have to miss out on the fireworks and concerts that evening so we decided to try and catch the parade in the morning. Trying to get to the Champs-Élysées that morning was difficult since most of the subway stops had been closed off by police thanks to the massive crowds lining up to watch the parade. Once we finally found a subway station that was open and emerged from the ground, I was overwhelmed by the amount of people surrounding me. I have never seen a city so crowded as it was that morning. There were people in trees, standing on ladders and benches, all so that they could catch a glimpse of the troops marching and riding by. The Champs was lined in French flags and with the cheering and music playing even I felt a sense of pride for the French nation. Since we were unable to get a spot close to the road where the parade would be passing by, I ended up watching most of it through the video camera of a man standing several feet in front of me. C’est la vie. 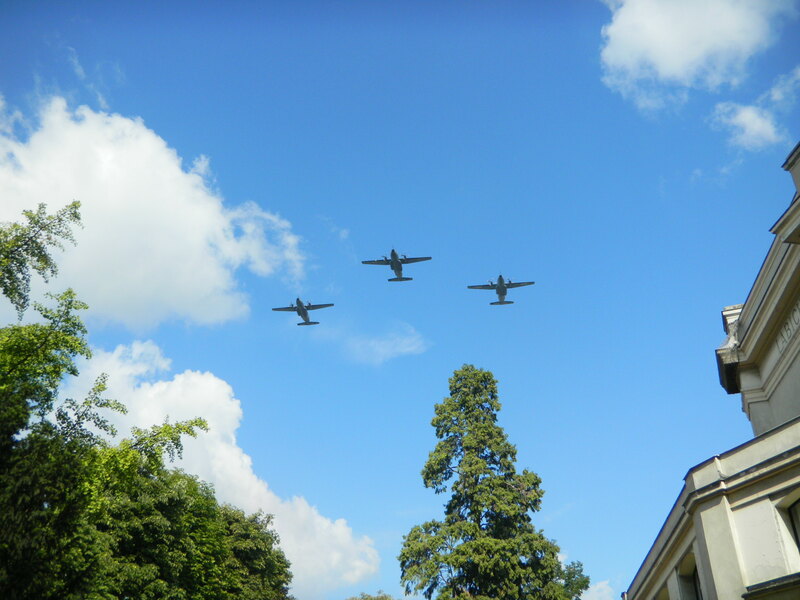 As the parade was coming to a close there were at least 10 different aircraft fly-overs, which you don’t need a good spot for in order to see. The rest of our day in Paris was spent trying to hide from the massive crowds on the street by taking cover in restaurants and the shopping center under the Louvre. Later that day we caught our train south and ended up in our small French town late in the evening. When we arrived we began our search for our hostel which ended up being fairly far from the train station and in a sketchy part of the neighborhood. We got there just in time to check-in for the evening. But when the owner of the hostel went to check our group in there was no reservation under my friend’s name for that evening. This had to be a mistake. But it turned out that my friend had booked our room for the following evening instead. After getting the recommendation of another hostel in the area, we were on our way in search of this new place hoping that they would still have room for the night. C’est la vie. When we got to the other hostel they had one room left for four people (the number in my group) and the room even had its own bathroom! The next morning we hopped on the train that took us into Spain and eventually to Barcelona. 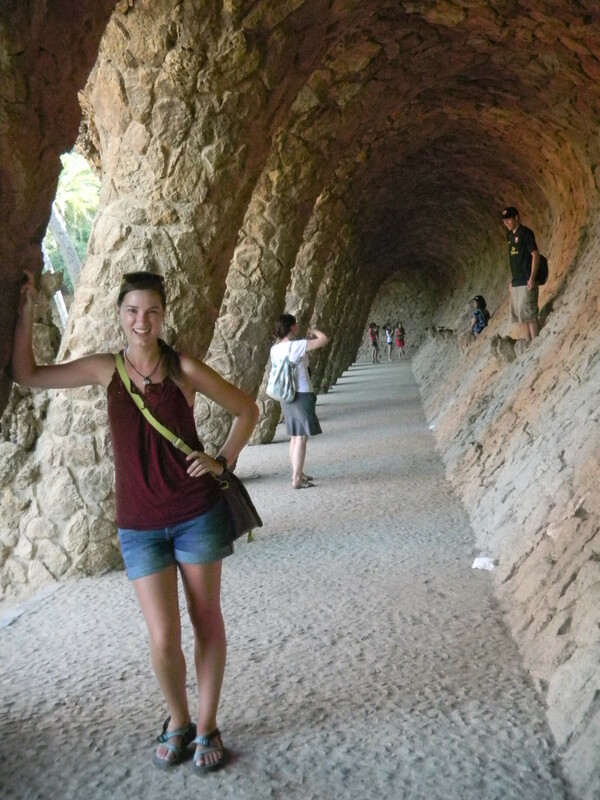 I loved Barcelona! Before going I had this image of what I thought the city would look like. I imagined it to be a dirty, Spanish version of Paris. Boy was I wrong. Barcelona is an exceptionally clean city including its streets and even its public transportation system. The architecture is stunning; especially those buildings designed by architect Antoni Gaudí such as the Sagrada Familia, one of the first things I saw while in Barcelona. After exploring the city, we headed out to Camp Nou, home of the FC Barcelona football club. I’ve never been a big soccer enthusiast, but seeing the pride and fan dedication to the team while I was there was overwhelming. I definitely felt like I was part of the culture as I listened to the official Barça anthem, the “Cant del Barça” and imagined what it would be like on game days as I stood next to the field looking up at the stands surrounding me. That evening we met up with one of our friends from Tech who had been studying in Barcelona for the summer as well as some other GTL students. They took us to Park Güell, a park with architectural elements designed by Gaudí, which is situated on a hill overlooking the city. Since it sits so high above the city there are lots of steep streets you have to walk up in order to get there. Many of these streets had escalators built into the side of them! From the main terrace of the park we got beautiful panoramic views of the city below us. 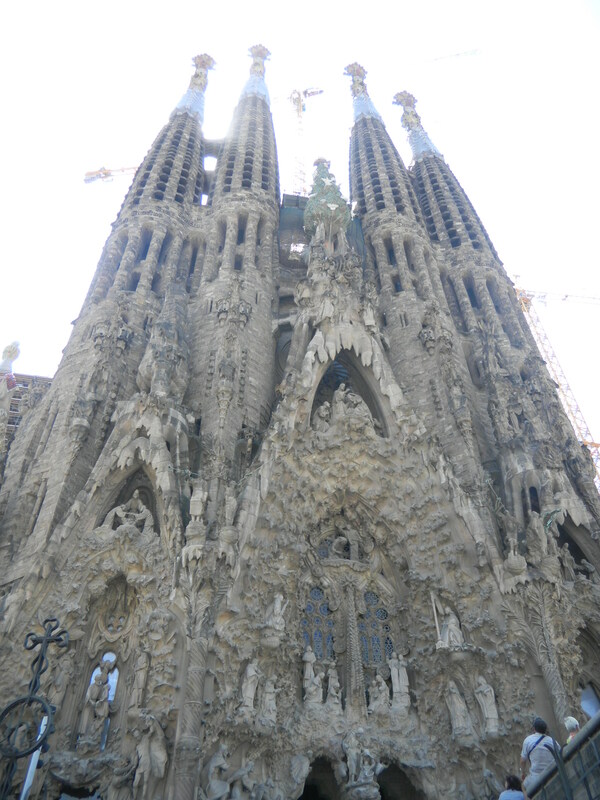 It was incredible to see the Sagrada Familia rising high above all the other buildings in the area. 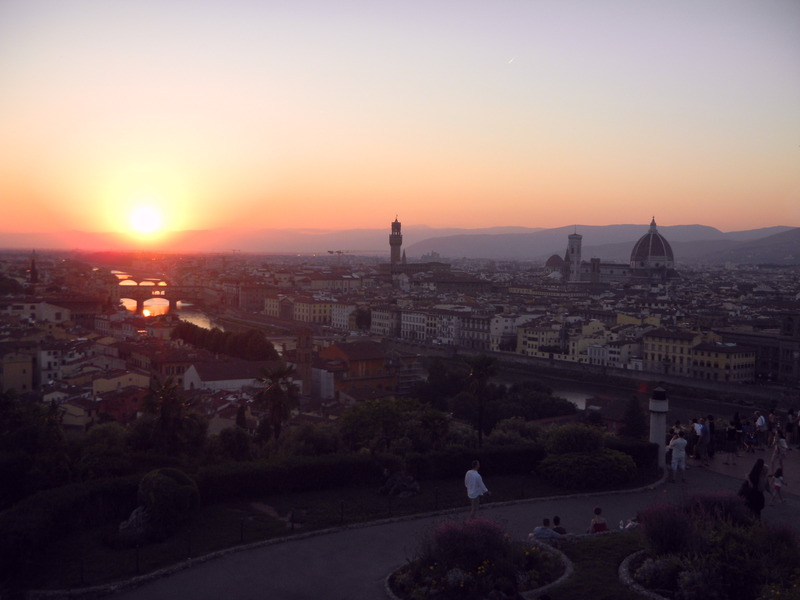 Being there reminded me so much of my time in Florence when I watched the sunset over the city. The next day we woke up early in order to get downtown to catch one of the local bike tours. With our directions in hand we navigated our way to the plaza listed as our final destination. But when we arrived there was no bike company in sight. It turns out that we had gotten lost and had ended up in the wrong plaza…there are so many in a Spanish city! C’est la vie. Since we had missed the tour we ended up spending the day exploring a new part of the city, walking down by the beach, and up La Rambla, a pedestrian street filled with local vendors and tourists. While we were walking around we came across a restaurant with a special on paella, a popular Spanish rice dish, and sangria. After this incredible meal we went back to Park Güell where we saw the arched walkways, ornate mosaic designs, and curved terraces that make the park so famous. The buildings at the main entrance to park reminded me of something one would find in the Candyland game. One thing I really wanted to do in Spain was go to a tapas bar and that evening we met up with the other group from the night before and went to Ciudad Condal, a popular tapas bar in downtown Barcelona. Since there were so many of us in the group we were able to order lots of dishes and sample a little bit of everything. I was able to try things like roasted peppers and cheese, mussels, shrimp, fried anchovies, habanero peppers, baby squid, Spanish omelet, cuttlefish, goose liver, and so much more. We finished up the evening by walking around the city where we came across a guitarist who had been traveling the world. He wrote his own music and had a great outlook on life. At one point he said, “You can’t dream your life, you have to live your dream.” Later that night, after we had returned to our hostel, I got sick thanks to the Spanish heat and the rich variety of tapas I had consumed earlier. C’est la vie. The evening was still an incredible experience and well worth it. In the morning I woke up feeling pretty weak and was looking forward to spending most of the day on the train to get back to Metz. On the train back to Paris there were at least 20 other GTL students on board with us. My group and I slept throughout most of the trip until one of our friends woke us up saying that the train had been stopped at one of the stations for over a hour due to maintenance issues. Because of this we were going to be delayed getting into Paris, which meant that we were likely going to miss our train to Metz. The train never made up the time. In fact, we got into Paris even later than expected and knew that there was no way we would be getting out of the city that night. C’est la vie. 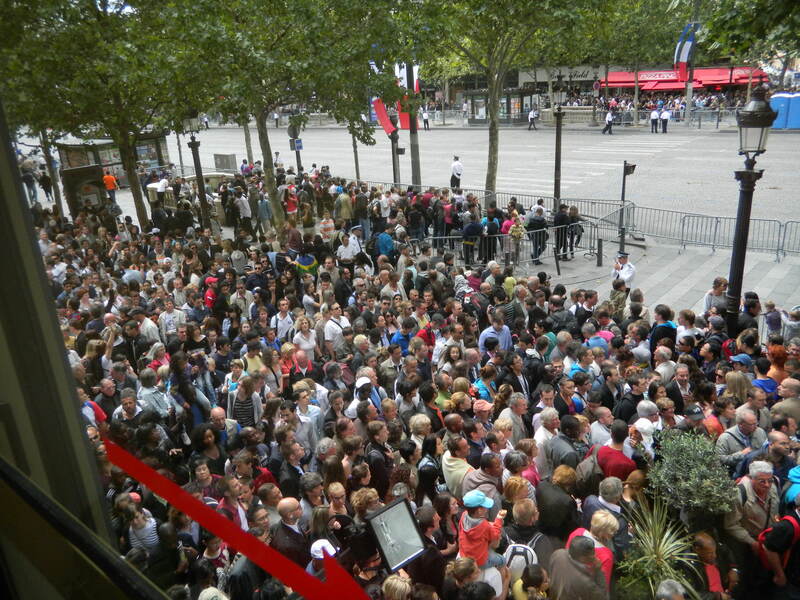 When we got to Paris we immediately went to the customer service desk and explained our situation. They ended up putting all of us in really nice hotels right next to the train station and got us all tickets for a train to Metz the next morning. I was so excited because this meant that I would still be able to make it to my 9am class. Of course when we got into Metz the next morning it was pouring rain and cold (and I was still in shorts and a tank top from sunny Barcelona) and the bus that we needed to catch in order to get to the GTL building was 30 minutes late. I still managed to make it to class soaking wet and cold only to find that about 5 other people out of a class of over 30 had decided to come that day. So my professor ended up cancelling class. All that worrying for nothing. Oh well, c’est la vie. Three weeks ago I had the opportunity to spend five incredible days traveling throughout Italy. 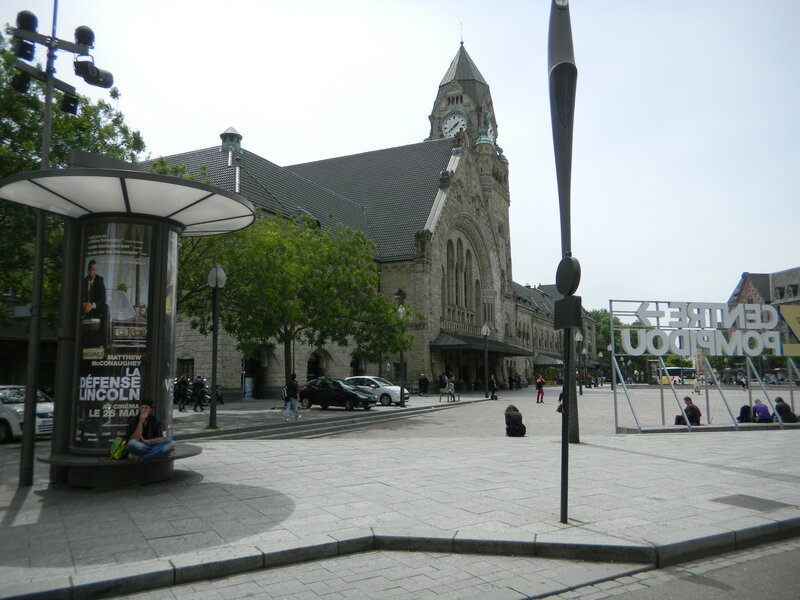 Thursday night I left Metz with my travel group on a train to Dijonville, France so that we could catch an overnight train from there to Florence, Italy. However, Italian trains are notorious for never being on time and sure enough our train from Dijonville was delayed 1.5 hours. 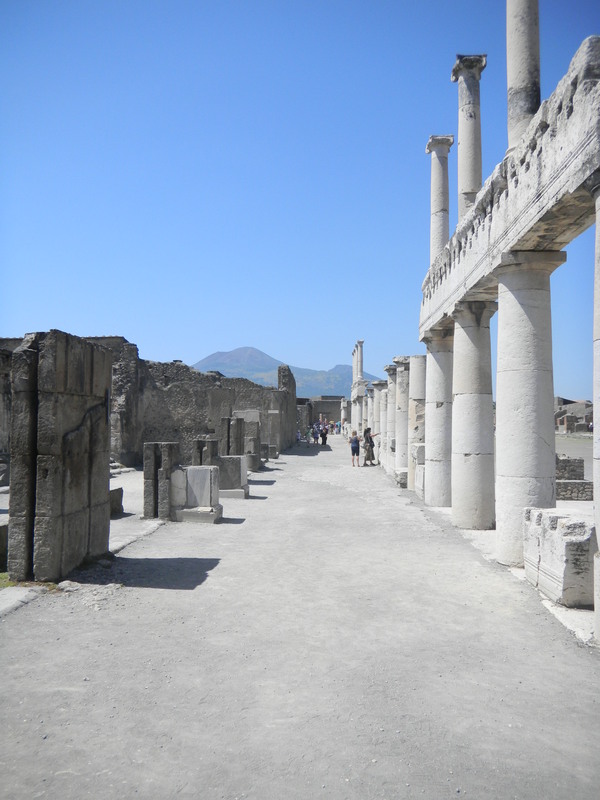 Our plan for Friday was to get a train out of Florence down to Naples so that we could spend the day exploring Pompeii. We arrived in Florence 2.5 hours late so we missed our original train going to Naples. Thankfully when we got off the train the one sitting right next to us was leaving for Naples about five minutes later. After running to the platform and explaining our situation to the conductor we were on our way south. Even though it was out of the way, I’m so glad I had the chance to see Pompeii. What surprised me the most was how large it was! After spending all day walking through the ruins we took a look at a map of the area and found out that we had only seen about a sixth of it. And it appeared that a lot of the area was still being excavated. Walking through the streets of the city it was easy to imagine what life must have been like. But every time I would turn a corner and see Mount Vesuvius rising up in the background all those thoughts would change. To think that people were caught just going about their daily business when it erupted just gives me chills. After finishing up touring Pompeii it was time to head back into Naples to grab some dinner before hopping back onto a train to our next destination. I had the first of many delicious pizzas during this time. A simple mozzarella, basil and tomato pizza. Yum! At this point our group split and while most headed on to Rome I went with two of my friends to Cinque Terre. 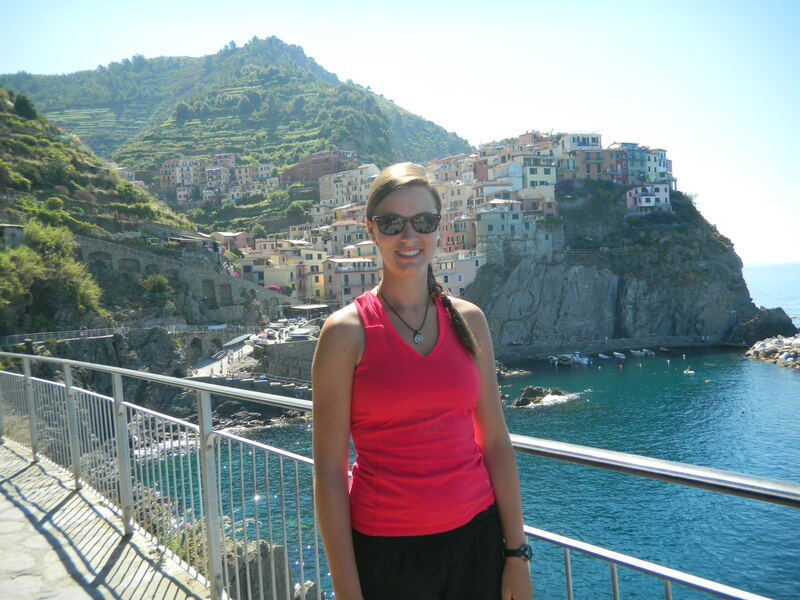 Cinque Terre makes up a portion of the coast on the Italian Riviera. 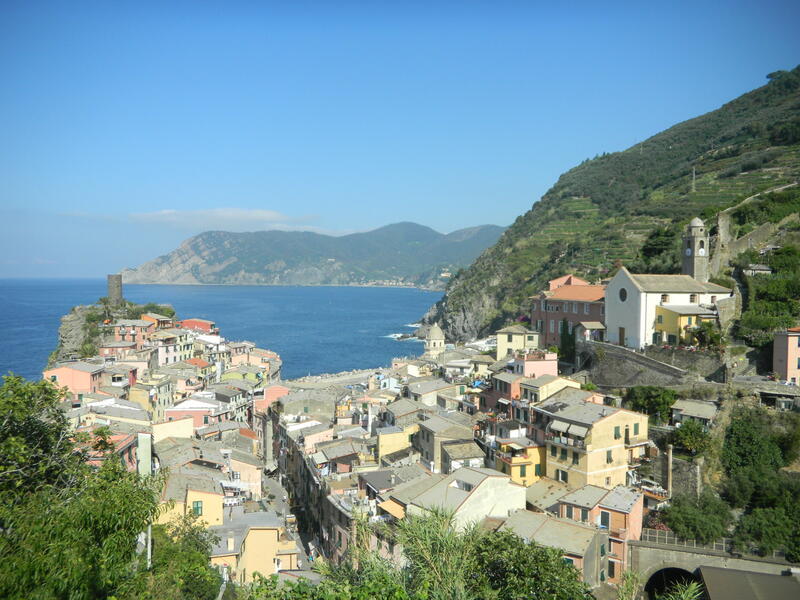 It is composed of five cities: Monterosso, Vernazza, Corniglia, Manarola, and Riomaggiore. They are so close together that it only takes about 20 minutes by train (including stops) to get from the first to the last city! We knew that we would only have two days in Cinque Terre so in order to maximize our time we got on a train from Naples that put us in La Spezia (a large city near the area) around 4:30 in the morning on Saturday. After getting about a hour of sleep we arrived in a very empty La Spezia train station and hopped on a train to the furthest of the five cities, Monterosso. Even though it was early, it was really neat to get into the city at that time because we were the only ones there. We immediately headed down to the beach and after waiting a few hours we were able to grab some breakfast and watch a beautiful sunrise over the mountains. We also did a little exploring of the next city, Vernazza before heading to our “home base” city, Riomaggiore where our hostel was located. What an awesome place to stay! Our hostel was more like an apartment that was tucked away near the harbor. You had to walk through all these narrow streets to get to it. It was exactly what I imagined Italy would be like. After getting settled in (it was only 10am by this point) we decided to spend the rest of the day relaxing on the beach. So we headed back to Monterosso, the city we had originally seen 5 hours earlier, because it was known to have the best beaches out of the five cities. By this time the town was buzzing with locals and tourists all looking for a prime beach spot. It was quite a difference from the morning! It was so incredible to be able to rent beach chairs, swim in the Mediterranean, and take well deserved naps on the gorgeous, sandy beach. Several times while I was swimming in the water I had to remind myself that I was in Italy in the Mediterranean! I just couldn’t get over that thought. After a day in the sun we headed back to our hostel and went out searching for dinner. You know you’re in Italy when the toughest decision you have to make during the day is whether to have pizza or pasta for dinner. But since we were in a city where the economy is so dependent on the fishing industry we all decided to go for some seafood. I had a delicious meal of shrimp and gnocchi (I had to get my fill of pasta). And of course we followed up dinner with gelato! The next day we decided we would try to visit all five cities. There are trails that run between all of them so we decided that we would hike from one city to another. We were able to hike along the Via Dell’Amore (“Love Walk”) from Riomaggiore to Manarola but unfortunately the trail continuing on to the next city Corniglia was closed because of recent mud slides. Fortunately, we were still able to get there by train. Corniglia is much different from the other cities because it sits up in the cliffs and doesn’t have any beaches. From the train stop it’s a 382 step climb to reach the city square. While we were exploring this city we came to an overlook where you had stunning panoramic views of the ocean and cliffs surrounding us. Looking around we noticed a cove far below us where people were swimming. There was obviously no beach, only large boulders, but we still decided to go down there to see. It was quite a climb down, but oh so rewarding! This was by far one of my favorite spots in Italy. Since it was such an effort to get down to the cove there were very few tourists and mainly locals. The water was crystal clear and absolutely gorgeous. We spent time swimming, talking to the locals, and jumping into the water from some of the cliffs. After spending most of the afternoon here we continued our hike onto the next city, Vernazza. Along this trail we were awarded with more spectacular views of the cities in the far distance and the sun reflecting perfectly off of the ocean. After heading back to Riomaggiore and grabbing dinner we decided to attend mass at a small church near to top of the city. Earlier in the day we had seen processions through the cities that were coming from the churches. We thought it would be an interesting experience since the mass would be in Italian and we wanted to figure out about the events from earlier in the day. Sure enough after the service we lined up outside with all the other service attendees and followed the procession through their beautifully lit city down to the harbor where an alter had been built using a boat and fishing net. Walking though the streets, which had been covered in flowers during the service, I truly felt a connection to the city and its people. It was really difficult to leave Cinque Terre on Monday. But we had to get on a train to Florence so that we could meet up with the other half of our group who had gone to Rome. Along the way we made a quick stop in Pisa. 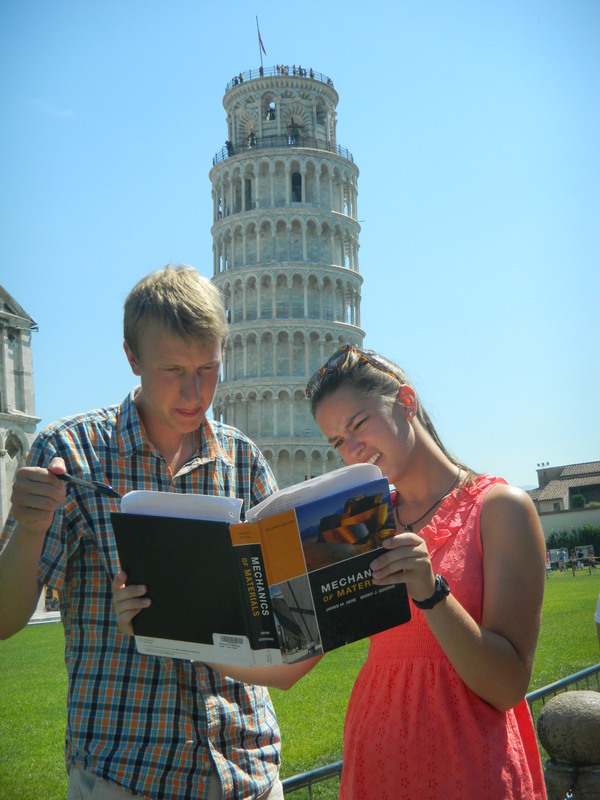 We had just enough time to go find the Leaning Tower of Pisa, take the classic tourist shots, grab lunch and hop back on the train. When we arrived in Florence we spent time walking through the streets passing through the Piazza della Signoria and by the Arno River. We then grabbed our first of three gelatos for the day before waiting to stand in line to get to the top of the Duomo, the famous domed cathedral of the city. The views from the top were definitely worth the wait. It was so neat to look down upon all the red tiled roofs and observe the layout of the city. That evening we went to a plaza overlooking the city to watch the sunset. It was a stunning setting. With two musicians playing relaxing music in the background and being surrounded by my friends it was definitely the perfect ending to a perfect trip. There’s a famous quote that says, “Life is not measured by the number of breaths we take but by the moments that take our breath away.” I feel like this has been and will continue to be one of the themes for my time spent in Europe this summer. It has been an incredible adventure so far. Whenever I look at my calendar I can’t believe how quickly the time has gone by since arriving in Metz. I have less than a month left here! So far I’ve traveled to Luxembourg, Paris, Switzerland, Germany, Cannes in southern France, Italy, and Mont Blanc in the Alps. Every place I have been has been unique in its own way, but there have been two trips where I’ve caught myself thinking “How can what I’m looking at be real?” These are the places that have truly taken my breath away. Over a month ago I spent a four day weekend in Interlaken, Switzerland which is situated amongst the stunning Swiss Alps. Two of the days there were spent hiking. The first that we did was very familiar to me. 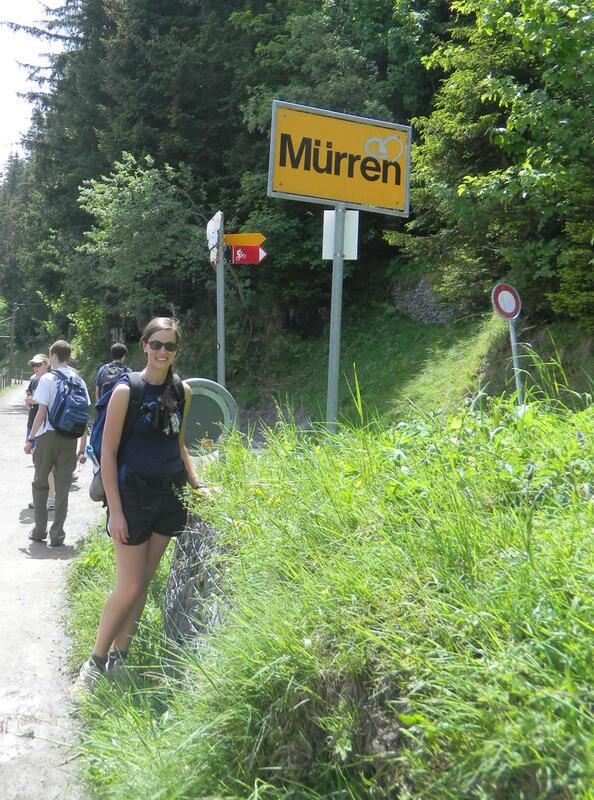 The trail goes from Lauterbrunnen to Mürren, a small alpine village where you won’t find any cars. My Dad is a retired Army Colonel and when I was younger we were stationed in Germany for four years. 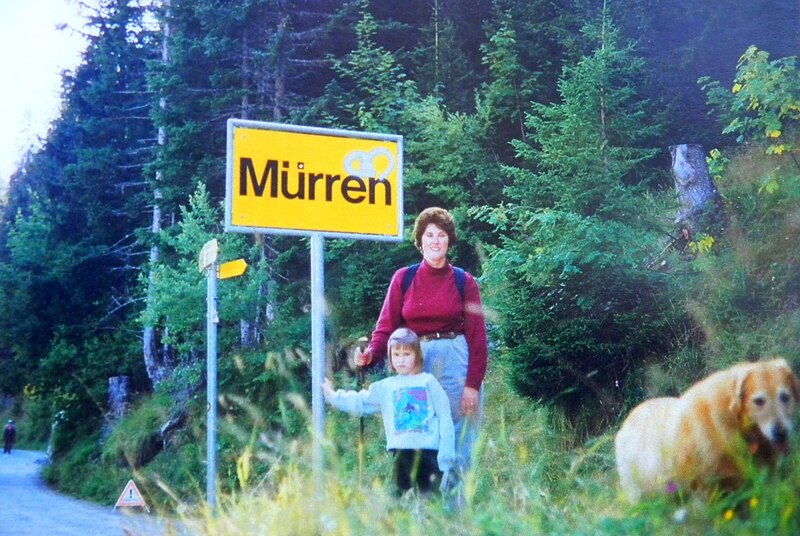 During that time we did a lot of hiking and when I was five years old I completed this very hike to Mürren. The hike is absolutely stunning. Once you make the climb from Lauterbrunnen the rest of the trail is fairly flat and takes you through beautiful alpine meadows which were full of flowers while we were there. 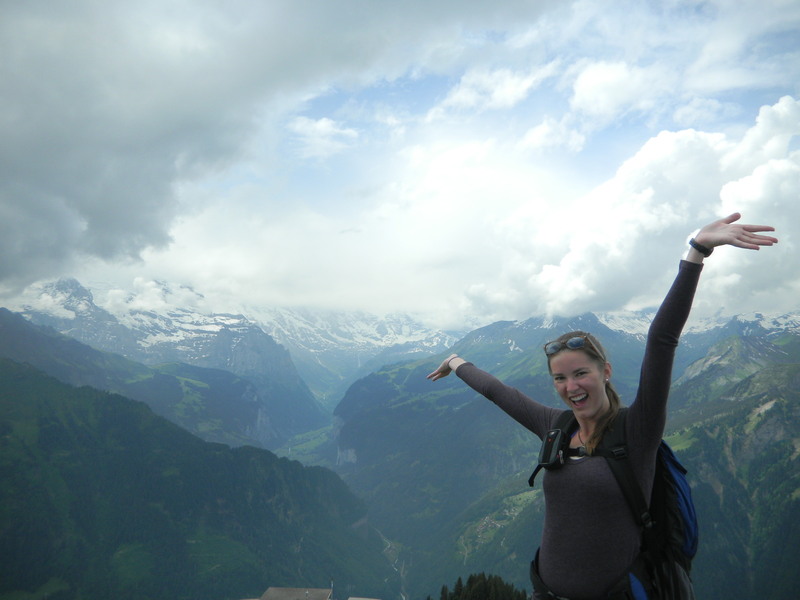 The most rewarding aspect of this hike were the panoramic views of the three tallest peaks in Switzerland: the Eiger, Mönch, and Jungfrau. As we got closer to Mürren I noticed this bright yellow sign with the name of the city displayed on it. The sight seemed really familiar to me so I decided to have my picture taken in front of it. A few weeks ago my Mom sent me pictures from when I had hiked the trail over 14 years ago. And sure enough there was a picture of me standing next to her in front of this yellow sign! Taken when I was five years old. When we came to the end of our hike in Mürren we found a spot to rest before heading back down. This place overlooked the valley beneath us but also provided more incredible views of the looming mountains. By this point we were high enough up that we could see the launching point for paragliders beneath us. Several times the clouds would roll in and we would be surrounded by them, unable to see anything past a few feet. I think the reason I enjoy hiking so much is that it provides you with a way to get away from the crowds of tourists and instead surround yourself by nature. It also provides you with views that you wouldn’t normally have the chance to see. 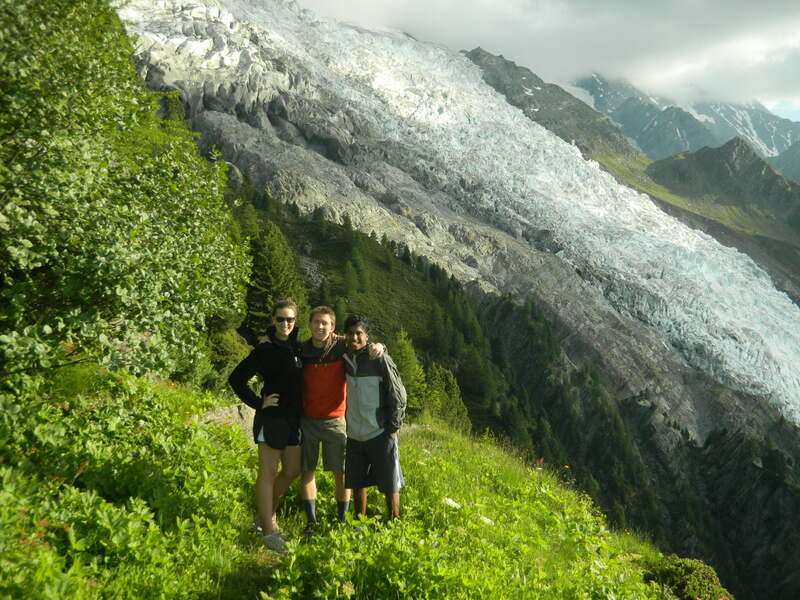 Last weekend I got to enjoy even more hiking with two of my friends when we traveled to the town of Chamonix to see Mont Blanc. Mont Blanc is the highest mountain in Europe and is situated in the Alps bordering France and Italy. Unlike the long 4 day weekend I had in Switzerland, I only had two days to spend in this area. After a long day of travel on Saturday (thanks to train strikes in the area) we finally arrived at our destination. Because of our train delays we arrived at 3:30 in the afternoon instead of 10 in the morning. Once there, we immediately raced to the tourism office to get information about hikes close by that not only provided great views but that would allow us to finish before it got dark. Once we had this information we stopped by a local grocery store to pick up dinner to eat on the trail and then we were on our way. 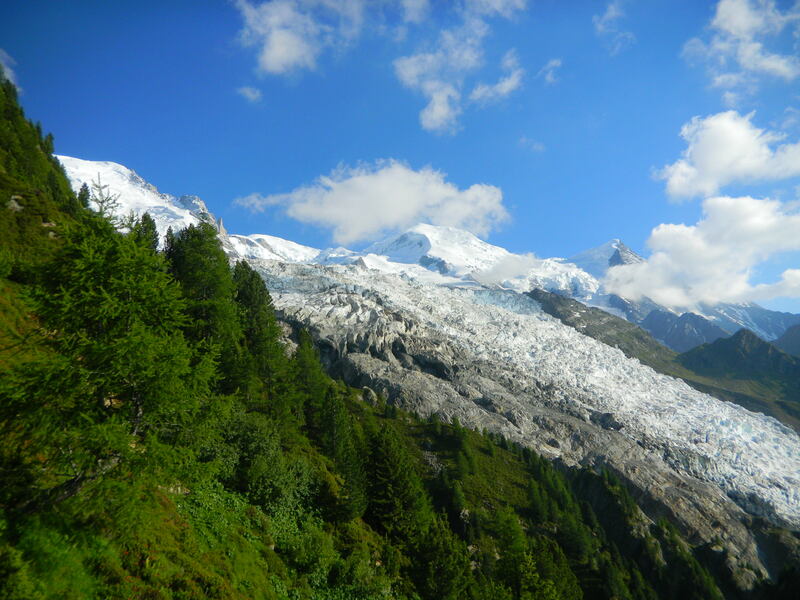 Our goal was to make it up to this glacier that was below the summit of Mont Blanc. 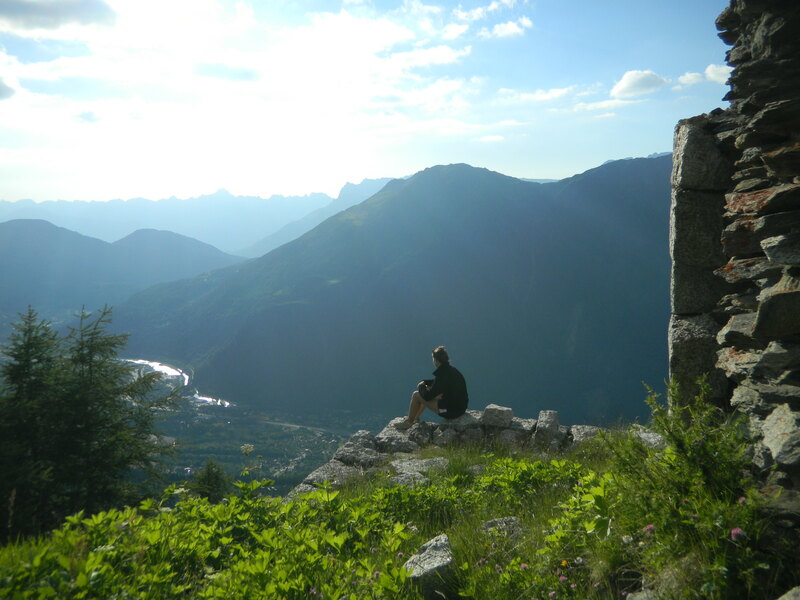 The hike up provided us with incredible views of the town below us and the mountains surrounding us. After a couple of hours and many questions wondering if we were ever going to see a glacier we finally came upon a meadow where we found an old cable car platform. And sure enough just beyond this platform was the stunning glacier. Being able to stand there at the edge of a cliff overlooking this feature definitely took my breath away.